How you got involved in your sport: I was first approached in 2004 at the urging of National Team Boccia Coach. I finally decided to try boccia it in 2010 and fell in love. 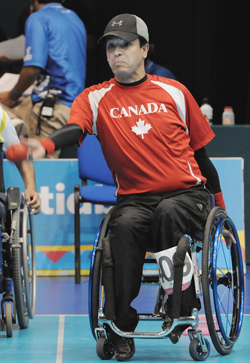 The moment you knew you wanted to represent Canada: The first time I threw a boccia ball. La première fois que j’ai lancé une balle de boccia. CAN Fund Testimonial: Setting goals is one thing but to achieve them without sources like CAN Fund is daunting if not impossible. Se donner des buts c’est bien beau mais sans le support de source comme CAN fund la tâche s’avère ardue sinon impossible. Share one valuable tool that you use on a daily basis that helps you to be the best athlete you can be. Just knowing that you belong at the top level. Il faut savoir qu l’on appartient au niveau des meilleurs. Who is one person in your life that has impacted your career and what was it that they taught you? Stephan Dubuc former Team Canada wheelchair rugby assistant coach who passed away in 2000 who taught me to push my leadership skills. Stephan Dubuc ancien assistant entraîneur de l’équipe nationale de rugby en fauteuil roulant décédé en 2000 qui m’a poussé à exercer mon leadership. Fun Facts: I’m a veritable encyclopedia of useless pro sports facts. Je suis un veritable encyclopédie d’information inutile.